Originally known as Delphi, the area was consolidated by a Wall Street Banker who bought up all the claims and renamed the area Wall Street. As explained in Ken Jessen's books, Charles Caryl was attempting to turn the town into a Utopian paradise. Eventually, the mill shut down due to depts and its equipment was moved to Sugarloaf. 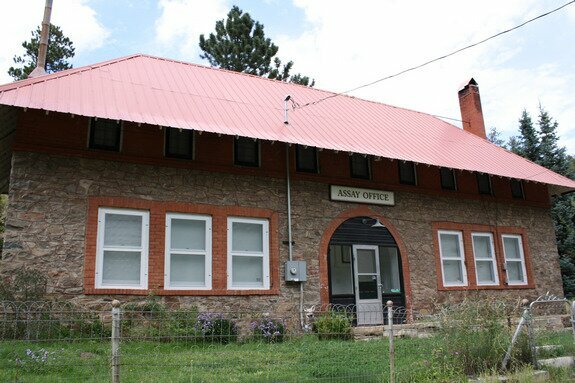 It is not known if a post office did exist, but today the town has several buildings of that era. The historic Assay Office now operates as a museum and the mill foundations are a wonder to see. Date Taken: 2009:09:10 16:06:52 Want to use this image? See the More information tab. Date Taken: 2009:09:10 16:09:45 Want to use this image? See the More information tab. Date Taken: 2009:09:10 16:10:13 Want to use this image? See the More information tab. Date Taken: 2009:09:10 16:12:26 Want to use this image? See the More information tab. Date Taken: 2009:09:10 16:13:51 Want to use this image? See the More information tab.